Her new HBO documentary asks us to sympathize with her. But should we? In Beyoncé's new documentary about Beyoncé co-directed by Beyoncé there's a shot of her flying in a helicopter checking her iPhone. As we see the real world below, the world of people who don't get to take those luxurious rides, Beyoncé says the following, in Beyoncé voiceover: "I think people have an idea in their heads about entertainers, celebrities. I think they feel like their lives are so perfect, and it's really hard to go through painful experiences when you're in the public eye, because it's hard to have closure." Beyoncé then cuts away to Beyoncé looking directly into the camera, describing her miscarriage, a traumatic experience for any woman, whether or not she's as trapped by celebrity as Beyoncé these days. Beyoncé's self-styled soapbox in HBO's Life Is but a Dream (airing Saturday) is a coda of sorts to weeks worth of Beyoncé-mania, starting with the inauguration and reaching its peak with the Super Bowl. And now, in the denouement, we're told we'll see the real Beyoncé, the one for whom life is not so effortless. This Beyoncé goes through the same real-life struggles we do, but all under the watchful eye of the public. The media's interest in her life is clearly the enemy here, even though many of us worship her every move. We're supposed to sympathize with Beyoncé—except when she finally does open up, she presents us with a pristinely guarded queen who's actually more distant than ever. Life Is but a Dream is supposed to be the official version of Beyoncé's behind-the-scenes life, as she see it. And it is. Except for all the talk about the importance of family, we ultimately discover that Beyoncé is deeply self-centered. She is still a wonder on stage, but she has been so perfect for so long that, in glimpses of her off the stage, Beyoncé appears constantly out of touch with the real world. In rehearsal scenes, important members of her crew and her entourage go unmentioned by name in any notable way, and their work is often portrayed as at odds with her vision for the stage act. Of course a Beyoncé movie directed by Beyoncé to promote a Beyoncé tour would portray a magical Beyoncé vision as stemming from Beyoncé herself, but about halfway through this thing you find yourself asking: Doesn't anyone else get some credit? Is this a documentary or a some kind of autobiopic? Beyoncé has never been one to be unfiltered. Just take her Tumblr: a marvelously put-together collection of professional photos and personal photos that look professional. In the documentary, though, Beyoncé implies that we are witnessing her important, rare moments of alone time. Amy Wallace's recent GQ profile explained that there exists a "Beyoncé archive," which contains "virtually every existing photograph of her, starting with the very first frames taken of Destiny's Child, the '90s girl group she once fronted; every interview she's ever done; every video of every show she's ever performed; every diary entry she's ever recorded while looking into the unblinking eye of her laptop." The "unblinking eye" of her laptop, as it appears in Life Is but a Dream, never catches any blemishes, nor snot, nor bed hed. The world got another taste of this self-love last week when her publicist asked BuzzFeed to take down photos of her Super Bowl performance. The outtakes from a Getty photographer were in this post about how "fierce" Beyoncé's halftime show looked, and the photos showed her body contracting and straining in ways that are, you know, pretty normal when a normal person is dancing vigorously. Last we heard, fierceness was not a bad thing—Beyoncé was, after all, Sasha Fierce. But bad photos of Beyoncé? That simply is not done in Beyoncé's world—even Getty had to delete the shots from its archive. And if other scenes in this documentary are any indication, Beyoncé has quite possibly never seen a single unflattering image of herself in any medium. She looks stunning when recording close-ups of herself in bad lighting. She looks stunning when she's going into labor. Watching her perform flawlessly is a thrill. Watching her go through hard times without a hair out of place just makes you feel bad about yourself. The media has not been altogether nice to Beyoncé in reviewing this HBO glamor project, which is being promoted as a "revealing" portrait "in her own words." 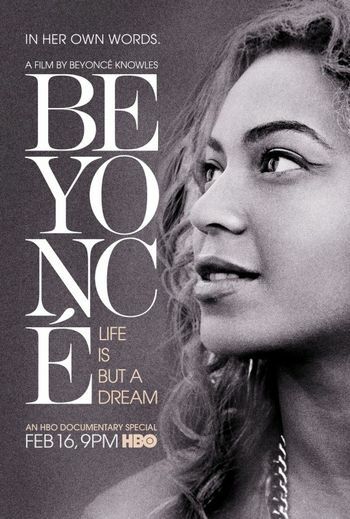 Brian Lowery writes at Variety: "For those who can't imagine growing tired of Beyonce Knowles' flawless face (or the rest of her), try going 90 wearisome minutes with 'Life Is But a Dream' a vanity project that puts tolerance for showbiz self-obsession to the test." Nitsuh Abebe at New York explains: "the parts of Life Is But a Dream that show us a 'real' and 'vulnerable' ­Beyoncé feel like the parts of job interviews where someone’s asked about their greatest weaknesses." David Rooney at the Hollywood Reporter says: "actually the 90-minute film is repetitious and bland." Alessandra Stanley at the New York Times deems it "gauzy, stylish and utterly opaque." And over at Salon, Willa Paskin calls it "fascinating"—which it is—but also a "high-level propaganda piece." Which it most certainly is. Beyoncé's message: being in the spotlight can be difficult. Well, of course it can. And in Life Is but a Dream, she's clearly feeling real, human emotion when she describes hearing the rumor that she has faked her pregnancy. And that was a particularly nasty rumor. But the media, for the most part, reveres Beyoncé. That's why perhaps everyone was so angry about the lip-syncing scandal following her performance of the national anthem on Inauguration Day. We know she's talented, so why couldn't she live up to the expectations of perfection that we expect? As much as we actually do want Beyoncé to like us—she is the closest thing we have to royalty over here, and her talent and beauty is remarkable—nobody is really sure Beyoncé wants to like us in return. We're the people who don't understand what it's really like for her, she tells us. And after this big "revealing" documentary, we still don't know what her real life is really like. Even though she swears she's just like everyone else, it doesn't seem like it. Maybe we'll get more in the Oprah interview that also airs on Saturday night. But probably not. Beyoncé herself—not just Beyoncé's dream life—prohibits us from feeling bad for her.